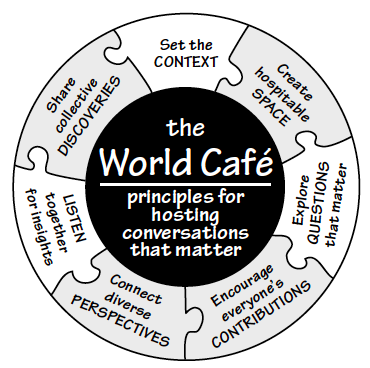 The World Café is a simple, yet powerful conversational process for fostering constructive dialogue, accessing collective intelligence, and creating innovative possibilities for action, particularly in groups that are larger than most traditional dialogue approaches are designed to accommodate. Anyone interested in creating conversations that matter can engage the World Café process, with its seven core design principles to improve people’s collective capacity to share knowledge and shape the future together. World Café conversations simultaneously enable us to notice a deeper living pattern of connections at work in our organizations and communities—the often invisible webs of conversation and meaning-making through which we already collectively shape the future, often in unintended ways. The following set of seven integrated World Café design principles has been developed over the years as a means of intentionally harnessing the power of conversation for business and social value. Clarify the purpose and broad parameters within which the dialogue will unfold. Ensure the welcoming environment and psychological safety that nurtures personal comfort and mutual respect. Focus collective attention on powerful questions that attract collaborative engagement. Enliven the relationship between the “me” and the “we” by inviting full participation and mutual giving. Use the living-system dynamics of emergence through intentionally increasing the diversity and density of connections among perspectives while retaining a common focus on core questions. Focus shared attention in ways that nurture coherence of thought without losing individual contributions. Make collective knowledge and insight visible and actionable. These simple principles, when used in combination, provide useful guidance for anyone seeking creative ways to foster authentic dialogue in which the goal is thinking together and creating actionable knowledge. Juanita Brown, Ph.D. is co-originator of the World Cafe and has served as a Senior Affiliate at the MIT Sloan School's Organizational Learning Center (now Society for Organizational Learning), as a Research Affiliate with the Institute for the Future and as a Fellow of the World Business Academy. David Isaacs is President of Clearing Communications and designs and facilitates strategic dialogues with senior leaders in the U.S. and abroad. David is also a Co-Founder ( with Juanita Brown) of the World Cafe Community Foundation and co-author of The World Cafe: Shaping Our Futures Through Conversations That Matter (BK 2005). The World Cafe Community is made up of organizational and community leaders and others who are fostering conversational leadership across the globe. This article is adapted from an excerpt in The World Cafe: Shaping Our Futures Through Conversations That Matter (BK 2005), by Juanita Brown, David Isaacs, and the World Cafe Community.